Today in Barcelona, Sony announced the successor to the Tablet Z, the Z2 Tablet. Coming in with a 10.1Inch Triluminos Display with Live Colour LED and powered by the 2.3GHz Quad-Core Qualcomm Snapdragon 801 processor and 3GB RAM the Z2 Tablet shares a lot with its namesake phone in terms of design language. 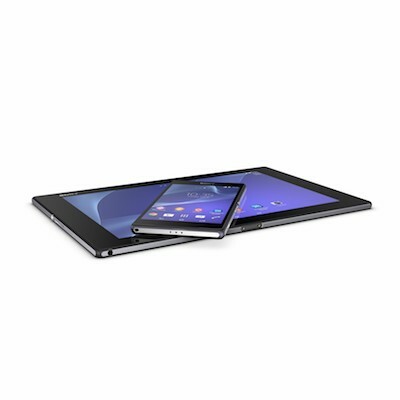 The Xperia Z2 Tablet is the slimmest and lightest 10.1inch tablet out there coming in at 6.4mm thin and only 426g/439g for WiFi/LTE model respectively. Rounding off the specs is an 8.1MP rear camera and 2.2 front facer so unfortunately no 4K recording here. The Xperia Z2 Tablet is the world’s first tablet display with Live Colour LED display, providing bright natural colours and perfectly sharp images in any light thanks to Sony’s latest BRAVIA TV technology expertise. The 10.1” Full HD TRILUMINOS™ Display for mobile is matched with Sony’s new Live Colour LED technology resulting in colours that have never been so real, more natural or so true to life. Add to the Sony’s unique X-Reality™ for mobile intelligent engine that analyses each image for optimal colour, sharpness and contrast while super resolution reproduces lacking pixels to ensure you get the ultimate viewing experience every time. The Xperia Z2 Tablet offers the clearest sound quality with Sony’s Front Surround™ audio technology that lets you enjoy dynamic sound. And now you can enjoy uninterrupted audio when you’re on the move, even on noisy trains or planes, thanks to the world’s first Digital Noise Cancelling technology in a tablet that reduces ambient noise by up to 98% when paired with theMDR-NC31EM Digital Noise Cancelling headset. 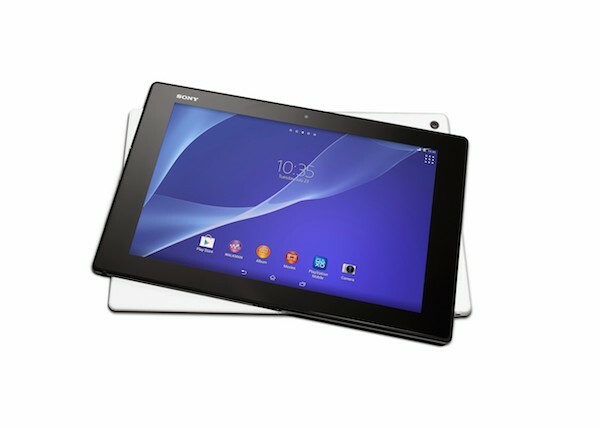 With Xperia Z2 Tablet, Sony has developed a tablet that is both beautifully sleek and portable. Using premium materials, every single detail has been carefully crafted to create the world’s slimmest (only 6.4mm) and lightest (only 426g for Wi-Fi model and 439g for LTE/3G model) waterproof tablet on the planet, making it extremely portable and comfortable to hold, even with just one hand. Sony’s acclaimed OmniBalance design creates an elegant shape that is delightfully slim yet reassuringly solid, providing balance and symmetry in all directions for a comfortable hold and beautiful look from all angles. And as you would expect from Sony, this lightweight beauty is also entirely waterproof taking every day life in its stride. “WALKMAN®” and Movies applications provide access to more than 25 million songs on the “WALKMAN®” app through Music Unlimited5 and tens of thousands of movies and TV series on the Movies app through Video Unlimited5 from Sony Entertainment Network. The Album app with PlayMemories™ Online6 makes it easy to securely upload, share and enjoy all of your photos and videos across your favourite Sony devices. Exclusive entertainment content offer6: Get 6 blockbuster movies from Sony Pictures including Captain Phillips, 30 days free trial from the Music Unlimited service and a range of PlayStation®Mobile games. Further enhance your entertainment experience with the latest tablet accessories. Create a Full HD TV style viewing experience with your tablet with the BSC10 Bluetooth® Speaker dock with Magnetic Charging Pad that lets you enjoy all your online and offline entertainment content with superior sound – all whilst charging. The BRH10 Bluetooth® Remote with Handset Functionadds full multimedia remote control functionality to your movie and gaming experience, as well as easy call handling via IP telephony or voice calling (LTE/3G variant only). Turn your tablet into a gaming console experience with Wireless Controller (DUALSHOCK®3), which brings the most intuitive PlayStation® style game play entertainment straight to your tablet. The Xperia Z2 Tablet features the fully integrated Qualcomm® Snapdragon™ 801 processor with 2.3 GHz processor quad-core Krait CPU that delivers high performance without draining the battery. Enjoy immersive multimedia experiences with stunning visuals and 3D gaming thanks to the enhanced graphics capabilities of the latest Adreno™ 330 GPU. Xperia Z2 Tablet can also spend less time charging with the integrated Qualcomm Quick Charge 2.0 technology, which enables devices to charge up to 75 percent faster than devices without the fast charging technology. The large 6000mAh lithium polymer battery, together with Sony’s leading Battery STAMINA Mode, provides up to 10 hours of uninterrupted multimedia usage and more than 100 hours music playback without having to recharge your battery. Turn your tablet into a laptop with the BKC50BT Bluetooth® Keyboard and Tablet Cover Standthat connects to your tablet for the ultimate laptop experience. The inclusion of OfficeSuite Pro 7 means you can view, edit and share native Microsoft Office files giving you the flexibility to work where and when you need to. The robust security architecture of the Xperia Z2 Tablet safeguards both your corporate and personal data, while at the same time providing support for multiple accounts that are quick and simple to set up. And if you’re new to Xperia or simply upgrading, then Xperia Transfer is the simple and easy way to seamlessly transfer your contacts, photos, bookmarks, apps, messages and much more from your existing Android or iOS tablet, swiftly and securely. Capture HD photos and videos in any light condition with the Xperia Z2 Tablet’s 8.1MP camera with Exmor RS™ for mobile. Superior Auto mode combines Scene Recognition with high quality and high performance image processing technology such as HDR and noise reduction to automatically capture the moment with the optimal settings. Perfect for video calling, the 2.2MP front-facing HD chat camera is ideal for catching up with family and friends. The pre-loaded suite of Xperia camera apps adds an extra dimension of fun and creativity to the camera experience. The Xperia Z2 Tablet will launch globally from March 2014. For the full list of Xperia Z2 Tablet specifications, click here.